A friend was recently singing the praises of her new bedframe to me, a platform-style bed with four large storage drawers built into its base. It put an idea in my mind, that maybe I should invest in such a thing, since I live in a pretty tiny apartment and can use all the extra storage space I can get. It also put an idea in my mind, that maybe while I was researching options for my own life, I might round up some for you guys to consider getting for your own homes! This platform bed is made of wood, and is outfitted with 38" x 23" storage drawers on caster wheels that can be rolled out for easy access to items like extra blankets and pillows, or for storing everyday items like sheets, towels or clothes. The bed comes in four colors — black, gray, brown and white — and comes with either two or four drawers, and it does require assembly that goes a bit beyond what would be described as easy. Sizes available: King, queen. 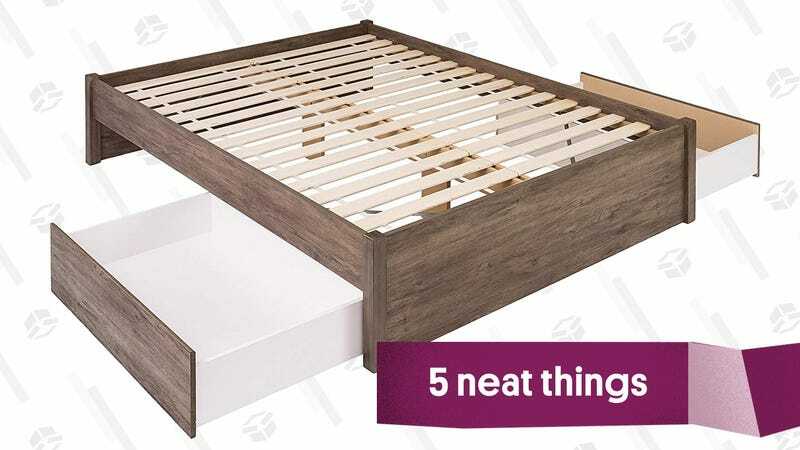 This platform-style bed is outfitted with four drawers that are 35" x 23.5" and it gets high marks from reviewers for ease of assembly and roominess of the storage drawers. The headboard and frame are covered in linen, and you have your choice of charcoal gray or a very lively green that’s somewhere in between grass and kelly. It does not require the use of a box spring. Sizes available: King, queen, full, twin. This laminate-faced platform bed features six extra deep drawers — six drawers! — that are mounted on metal rails and fitted with O-rings, so they can be pulled out with a finger and sit flush when not in use. This bed is a contemporary style with clean lines and doesn’t require a box spring, only a mattress. It gets good reviews for easy assembly. Sizes available: Queen. 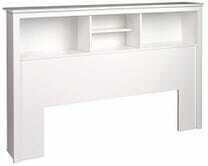 Drawers aren’t always the right solution for underbed storage, and platform beds aren’t everyone’s style. This metal “Victorian” style bed frame is extra high — the underbed clearance is 12.6 inches, so larger storage bins can fit with no problem. Because the sides are open, you’ll probably want to use a bedskirt to hide unsightly plastic bins, make sure to get one with at least a 12 inch drop, or chose rolling storage with a decorative look to it. Sizes available: Queen, full, twin. Another option for bed frame storage that doesn’t involve drawers is a storage-style headboard. This headboard comes in six colors (black, washed black, brown, white, cherry and warm cherry) and can accommodate either a double or queen mattress. The headboard itself is 11" deep, and the bookcase design has three sections — and the center section has an adjustable shelf — for storing books or tablets, alarm clocks or phones, and whatever other objects you might usually store in or on a bedside table. Sizes available: Queen, full.